Tamarit Park - Visit luxury campsites in Costa Dorada, Spain. Located within the tranquil region of Catalonia, the Spanish luxury camping site of Tamarit Park boasts attractions suited for the entire family. Promising fantastic architecture and luxurious seaside views, this tropical paradise promises one truely luxurious holiday break. Why should I visit Tamarit Park? Exciting selection from 470 camping pitches. Dogs are allowed during the off-peak season. A plethora of on-site amenities to enjoy. As with other camping holidays in Catalonia, the weather here is simply unbeatable. As Tamarit Park is located on the shores of Tarragona, visitors can enjoy agreeable temperatures throughout the year. Summers are warm and dry with very few cloudy days, and the spring and early autumn temperatures are more than inviting. These features provide camping luxury during any time of the year; a benefit for those who may not be able to visit during the standard tourist season. Setting this location firmly in the heart of luxury camping destinations are the exceptional facilities modern guests should expect. Some examples here include washing machines, tumble dryers, charcoal grilles, play areas for children and free Internet access. These are then combined with water and power connections to the individual mobile homes. Guests can literally expect to experience the lap of luxury when visiting Tamarit Park. Tamarit Park is a luxury camping site with a definite twist. Although some visitors may simply wish to sit back and absorb the sun, this location can also cater to those who hope to remain active during their stay. Some of the on-site attractions include tennis, miniature golf, table tennis, volleyball and golf. As the pitches are situated quite close to the Mediterranean Sea, examples of some nearby activities are water skiing, surfing, diving, swimming and boat hire. The options are endless, meaning a repeat visit is a must. 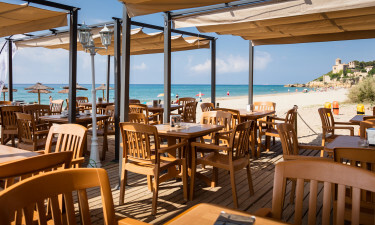 Tamarit Park Resort offers its patrons a number of restaurants to enjoy during their stay. A few of the most popular include El Club Snack Bar, Ovni Sports Bar and a local "xiringuito" found only moments from the beach. While full meals are included at most locations, takeaway orders are also available for those who prefer to dine in the luxury of their accommodation. Those hoping for a cool drink or cocktail should not pass up a chance to stop by the Amphitheatre Discoteca. A final benefit of Tamarit Park Resort is that guests will not have to leave its confines to purchase daily necessities. The combination of a supermarket and a bazaar will provide all visitors with such items as fresh produce, warm bread and international newspapers. There is also a small souvenir shop to pick up a few gifts for friends and loved ones, not to mention the completely separate bakery, boasting pastries and other tasty delicacies. Please feel free to speak with a representative of LUX-camp to learn more about this luxury camping opportunity.